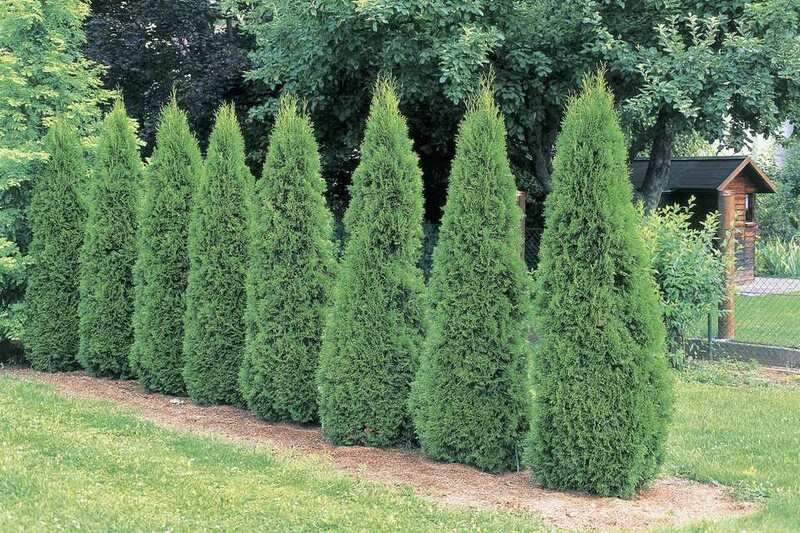 The arborvitae (Thuja) genus of shrubs and trees includes three different species comprising a large number of evergreens, ranging in size from 3 feet to 70 feet, with shapes ranging from low mounds to towering pyramids. Their popularity as landscape plants is due to their fast-growing, easy-to-care-for nature, and the year-round visual interest they bring to a landscape. One of the more popular cultivars of the Thuja occidentalis species of arborvitae is 'Emerald Green,' highly prized as a hedge or screen plant. This cultivar is sometimes known as 'Smaragd,' because the plant was originally developed in Denmark (Smaragd is the Danish word for emerald). While other members of the T. occidentalis species can be towering specimens as much as 60 feet tall, 'Emerald Green' is a semi-dwarf cultivar that has a narrow pyramid shape. The foliage consists of flat sprays of glossy bright green. The tree has urn-shaped cones about 1/2 inch long that turn reddish brown in fall. Most specimens are 7 to 15 feet in height, occasionally reaching 20 feet. This is a very popular plant for hedges and screens, especially in colder climates. It can also make a good foundation plant and is sometimes planted singly as a landscape specimen plant. Occasionally, this plant is pruned to form spiral topiaries. Native Area: T. occidentalis is native to eastern and central Canada south to northern Illinois, Ohio and New York, with smaller populations found in the Appalachians to North Carolina. Plant 'Emerald Green' arborvitae in moderately moist, well-drained soil in a full sun to partial shade location. In warmer climates, some shade is preferable. It should not be planted in full shade since this greatly reduces the density of the foliage. Avoid exposed, windy locations, especially in colder climates. Fall is generally the best time to plant an arborvitae since this minimizes heat stress. These are fast-growing shrubs/trees, so leave 3 to 4 feet between plants if you are planting 'Emerald Green' as a hedge or screen. When planting a container or ball-and-burlap shrub, make sure to plant it so the root ball is slightly above the level of the surrounding soil. When backfilling the hole, do not pack the soil too tightly, which can suffocate the roots. Water deeply twice a week until the plant becomes established. Once established, these trees need about 1/2 inch of water weekly through rainfall or irrigation. Soil needs to be kept moist but not soggy; apply a thick layer of compost or mulch over the root zone each year to preserve soil moisture. Feeding is usually not necessary with these plants. Heavy snow can break branches, so brushing off heavy snows is a good idea. Broken limbs should be pruned off, and the plants may need to be staked upright until they recover. 'Emerald Green' arborvitae should be grown in full sun to partial shade. They generally need at least 6 hours of sun daily; too little sunlight will make the plants sparse and leggy. Plant arborvitae in moist but well-drained soil that is neutral to alkaline in pH. These shrubs do not like to have their roots in soggy soil. 'Emerald Green' needs twice weekly watering for the first few months after planting, then weekly watering (about 1 inch) for the next year or so. Once established, make sure they get about 1/2 inch of water weekly, either through rainfall or irrigation. Too little water will cause the foliage to turn yellow or brown, while excessive water may cause needle discoloration and root rot. 'Emerald Green' arborvitae does better in cooler, dryer climates. In very humid conditions, fungal diseases can be a problem. Improving air circulation can prevent the fungal problems. This plant normally does not need feeding. However, if new growth is very sparse or slow, feeding with a balanced fertilizer containing all major nutrients is recommended. A light pruning in the early spring can help 'Emerald Green' remain neat and foster thicker growth. This involves light trimming of the leafy parts of the branch, not cutting back to bare wood. Dead or diseased branches should be removed to prevent decay and improve air circulation. Prune to maintain the natural shape of the shrub—wider at the bottom and tapering inward toward the top. This is one of the arborvitae cultivars that is sometimes pruned to form spiral topiaries. Arborvitaes are rarely troubled by insect and disease problems, but they sometimes suffer needle and twig blight caused by fungi, especially if air circulation is poor. To control blight, prune off all affected branches and treat with a fungicide. Bagworms may also feed on the foliage of arborvitaes. Control them by handpicking the egg bags and destroying them before the insects hatch. Spider mites and stem canker can also be problems. The foliage may turn yellow-brown with winter burn in exposed sites, especially in the northern extreme of the hardiness range. The branches are susceptible to breakage from ice and snow. Its cold hardiness makes 'Emerald Green' arborvitae a solid choice for northern landscapers, who might otherwise use Leyland cypress, a favorite in zone 6 and higher (Leyland is commonly grown in the South). 'Emerald Green' arborvitae might also be the choice over Leyland cypress in cases where a tall tree would be inappropriate. Whereas some cultivars of Leyland cypress reach at least 60 feet at maturity, 'Emerald Green' arborvitae usually reaches just 12 to 14 feet in height. These differences notwithstanding, the two trees have a similar look and are both popular, particularly as "living wall" privacy screens.